Aboriginal Bark Paintings are thought to be the oldest form of Indigenous art but this is hampered by the lack of longevity of the works unless scrupulously protected and cared for. 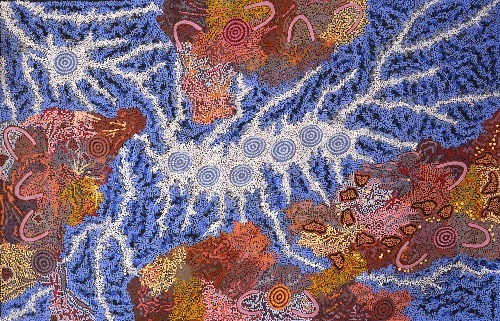 The majority of bark paintings come from Northern Australia, where a more semi realistic or stylised cross hatching or 'Xray' style of painting prevails. It was not intended by the original painters of these works that they would be kept and displayed in perpetuity – their purpose and use was more immediate, and hence how long the works would exist for was not in the equation. Times have changed, and now Indigenous Artists understand the western peoples' interest in the art, they have been assisted to make the works more robust. Still, wood and ochre are not the most durable of materials in the long term. Having said that, bark paintings are extraordinary, have a quality and palpable sense of history that is all their own.